Ballinamallard United have brought midfielder Shane McCabe back to Ferney Park for a second spell with the County Fermanagh club. The 33-year-old former Portadown, Glentoran and Glenavon player helped the Mallards to the Irish League Second Division title in 2003. 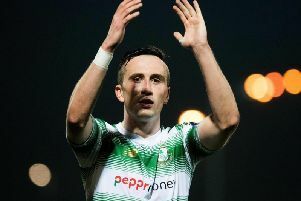 McCabe will help to fill the void left by the departure of fellow midfielder David Kee to Linfield. Ballinamallard have also signed striker Robbie Hume from Institute.